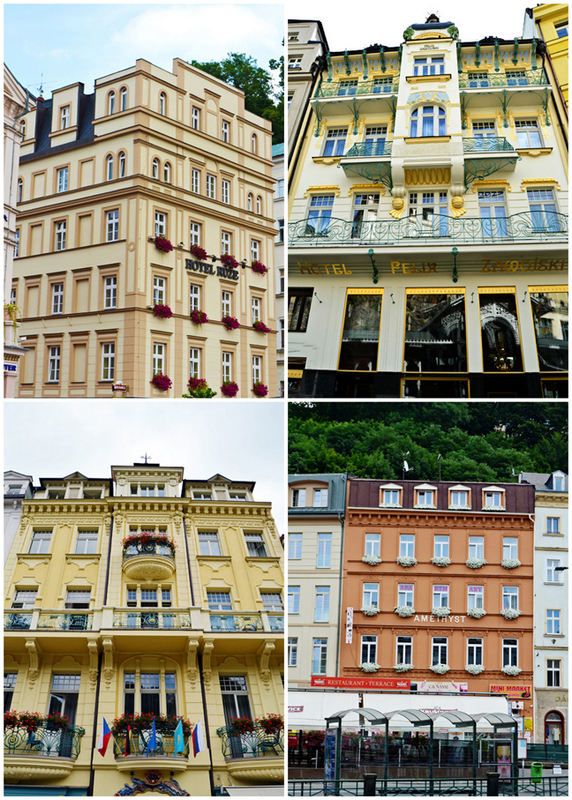 I have 79 pictures/collages that I want to share of Karlovy Vary, Czech Republic. I could NOT narrow them down anymore. 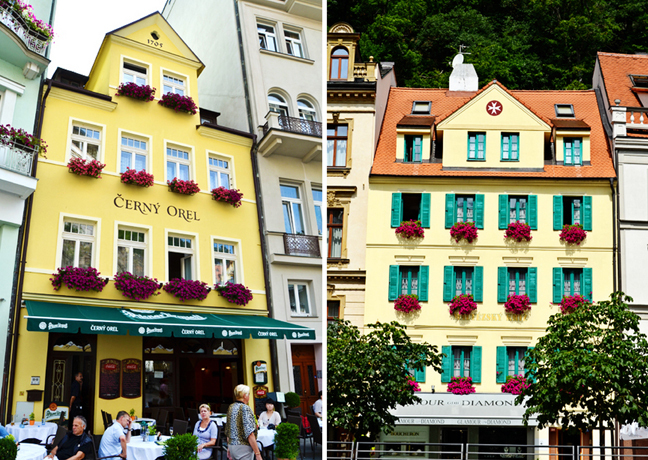 This city has THE cutest Art Nouveau buildings we've seen yet. Which reminds me, today marks our 1 year anniversary of traveling while living in Germany! Our very first #evansfamilyeuropeanadventure was to Weiden, Germany on Chris' birthday last August 3rd, 2013. Our friends let us borrow their car because ours hadn't arrived yet and we were itching to get out of the hotel after nearly 4 weeks being cooped up in there. Anyway, it's amazing what we've seen in a year! I blog about all our adventures and then update our TRAVEL page with those destinations. Can't wait to see what this year brings! But every weekend we've wanted/been able to go, the weather has been less than ideal. Welcome to Europe :) But, today was the day! And it sure didn't disappoint! In fact, it might be my new favorite city, honest-to-goodness. And it's only an hour-and-a-half away! 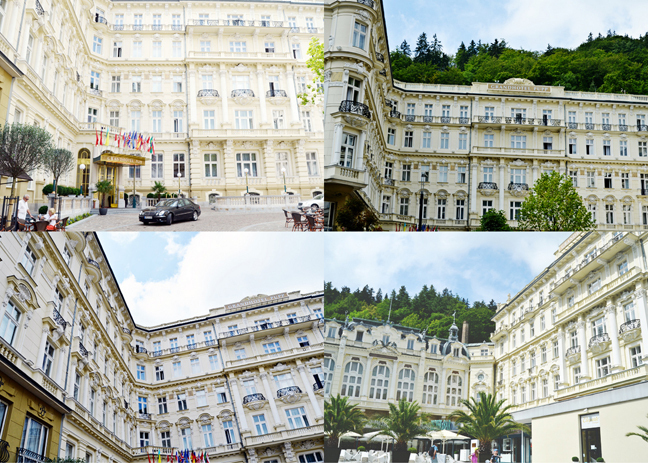 We're totally bringing anyone and everyone who comes and visits us to Karlovy Vary - hint hint, wink wink, nudge nudge. COME VISIT! We loaded up and were on the road by 8:30am. We drove through very Communist-looking cities. 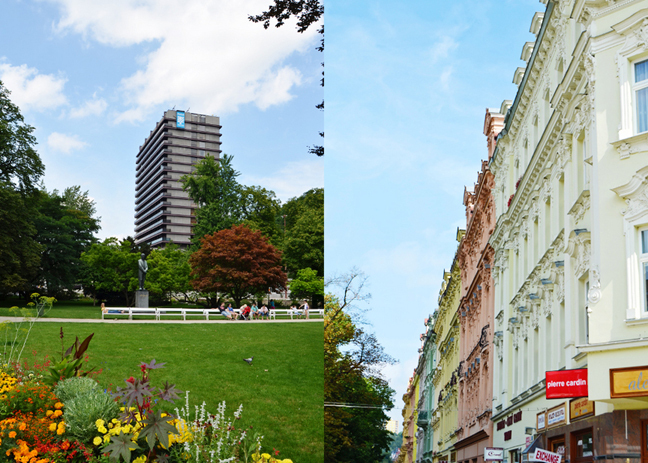 Karlovy Vary used to look like this too, but was recently given a makeover. The discovery of Karlovy Vary (Carlsbad in English) by Charles IV reads like a 14th-century episode of The Beverly Hillbillies. According to legend the king was out hunting for some food when up from the ground came bubbling water. 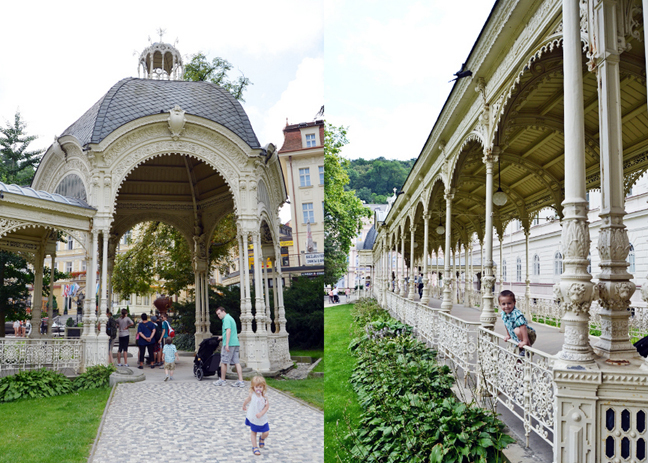 Knowing a good thing when we saw it, Charles immediately set to work building a small castle in the area, naming the town that evolved around it Karlovy Vary - which translates roughly as "Charles's Spa." 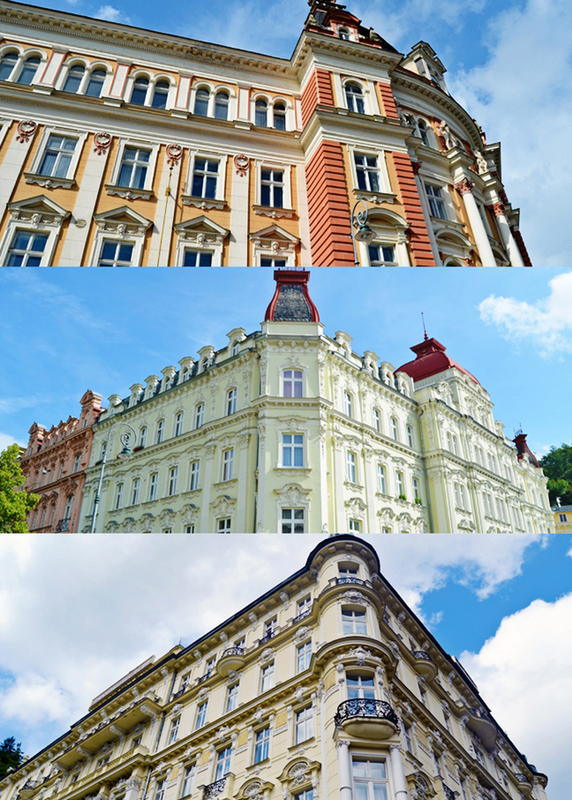 The first spa buildings were built in 1522 and before long, notables like Albrecht of Wallenstein, Peter the Great, and later Bach, Beethoven, Freud, and Marx all came to Karlovy Vary for a holiday retreat. 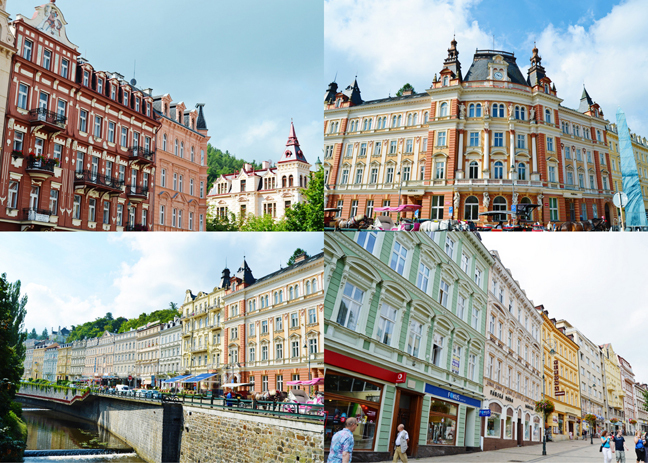 After WWII, East Bloc travelers discovered the town and Karlovy Vary became a destination for the proletariat. On doctors' orders most workers would enjoy regular stays of 1 to 3 weeks, letting the mineral waters ranging from 110 degrees to 162 degrees from the town's 12 thermal hot springs heal their tired and broken bodies. Even now, a large number of spa guests are here by a doctor's prescription. Sign me up! Here's how the spa cures and treatments go down: after consulting with a spa physician you're given a specific regimen of activities that may include mineral baths, massages, waxings, mudpacks, electrotherapy, and pure oxygen inhalation. After spending the morning at a spa or sanatorium you're usually directed to walk the paths of the town's surrounding forest. The common denominator of all the cures is an ample daily dose of hot mineral water. This water definitely has a distinct odor and taste. You'll see people chugging it down but it doesn't necessarily taste very good. Some thermal springs actually taste and smell like rotten eggs from the sulfur. Keep in mind that the waters are used to treat internal disorders so the minerals may cleanse the body thoroughly - in other words, they can cause diarrhea... TMI? We parked the car and the first thing we saw was an ice-cream stand. Ice cream makes everything better :) Oh. My. Goodness. The architecture is what most of this post is all about. I just love love love love love love love it. It didn't look this cute again until recently though. Most of the 40-plus years of Communist neglect have been erased as a barrage of renovations continues to restore the spa's former glory. Gone are almost all of the fading, crumbling building facades that used to line both sides of the river. In their places stand restored buildings, cherubs, caryatids, and more. 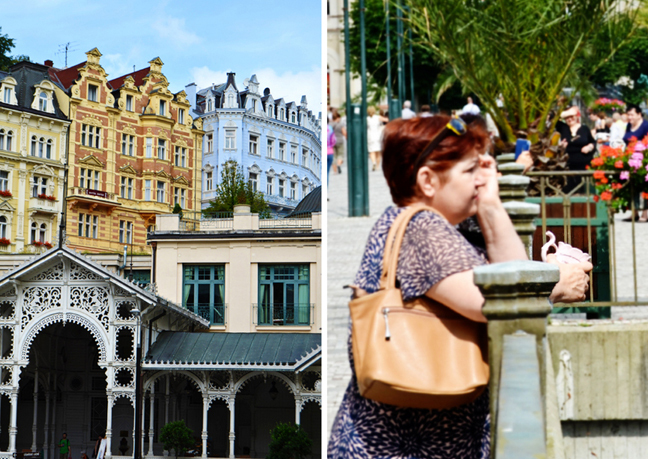 Today, some 150,000 people, both traditional clientele and newer patrons, travel to the spa resort every year to sip, bathe, and frolic through Karlovy Vary. The town's slow pace and pedestrian promenades, line with turn-of-the-20th-century Art Nouveau buildings, turn strolling into an art form. We were here a little over three hours but I needed at least another hour or two to take it all in! And we hear nighttime walks take on an even more mystical feel as the sewers, the river, and the many major cracks in the roads emit steam from the hot springs running underneath. We weren't there at night to witness this phenomenon, but you can bet we'll go back to see! We started our exploration at the Hotel Thermal on the north end of the Old Town's center. Built in the 1970s, it exemplifies how obtrusive Communist architecture can be. Nestled between the town's eastern hills and the Ohre River, the glass, steel, and concrete Hotel Thermal sticks out like a sore thumb amid the rest of the town's 19th-century architecture. Apparently many rich and famous people have stayed here during the annual film festival - they have an entire wall filled with celebrities who have graced the hotel with their presence. Supposedly there's an amazing view from the upper terrace of the hotel, but we weren't exactly sure where that was and the door to get out onto a terrace was locked. Oh wells. Still a cool view out the window. 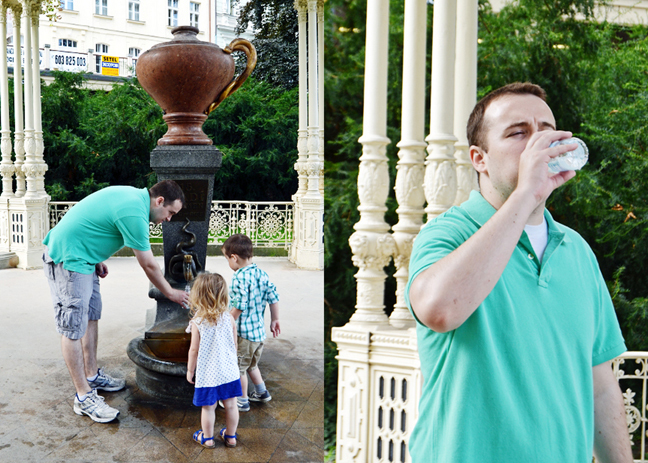 We exited the hotel and walked through a beautifully manicured park called Dvorákovy Sady. 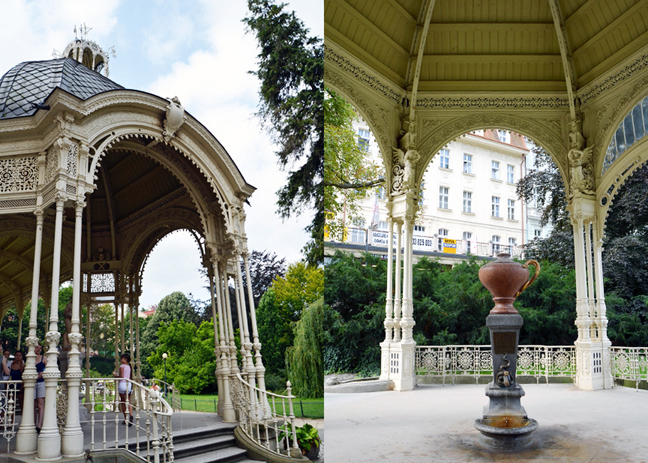 As we entered the heart of the town on the river's west side we saw the ornate, white, wrought-iron gazebo called Sadová Kolonáda. We found a hot spring! Chris was brave enough to try it using one of the kids' water bottles. You can tell from the look on his face how much he enjoyed it :) No thank you! This gazebo was just so pretty. We continued along the riverbank, taking it all in. Oh my wow. Another gazebo with another thermal spring inside. Cutest casino I've ever seen! About 100 meters after the Sadová Kolonáda we came to the Mlynská Kolonáda. This long covered walkway houses several springs which can be sampled for free 24 hours a day. Each spring has a plaque beside it describing its mineral elements and temperature. Bring your own cup or buy one just about anywhere to sip the water since most are too hot to drink from with your hands. 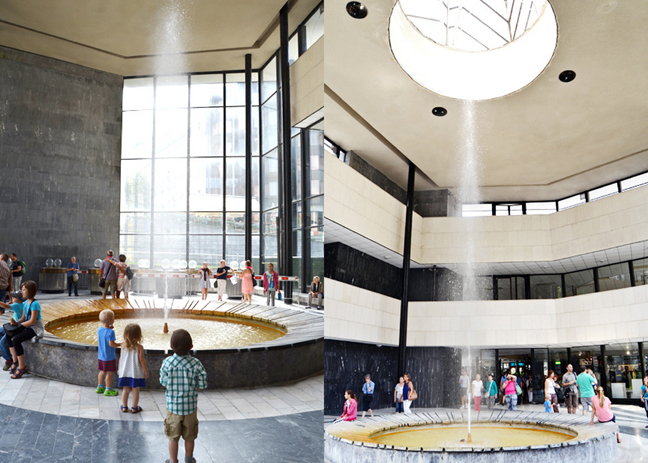 This fountain said it was 65 degrees Celsius, or 149 degrees Fahrenheit! We thought it was really cool how the minerals in the water have built up on the basins. It looked like the geyser pools at Yellowstone. The buildings across from the Mlynská Kolonáda. 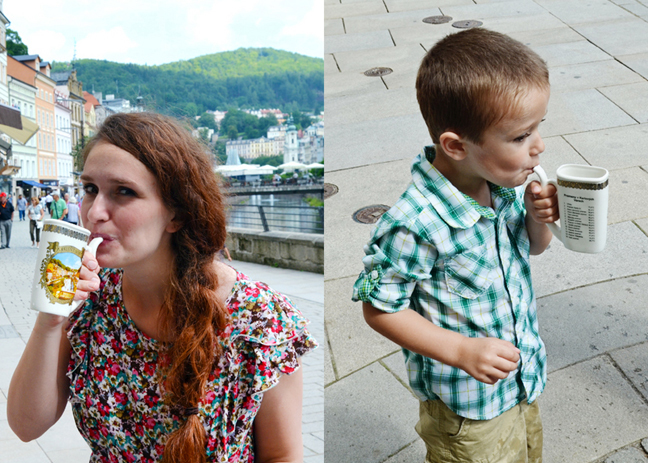 Our family on Saturday August 2nd 2014 in Karlovy Vary, Czech Republic. We headed down another pedestrian-only lane and I enjoyed looking into the windows and seeing all of the fancy pottery. I love when buildings curve. Pink and mint green? Yes please! 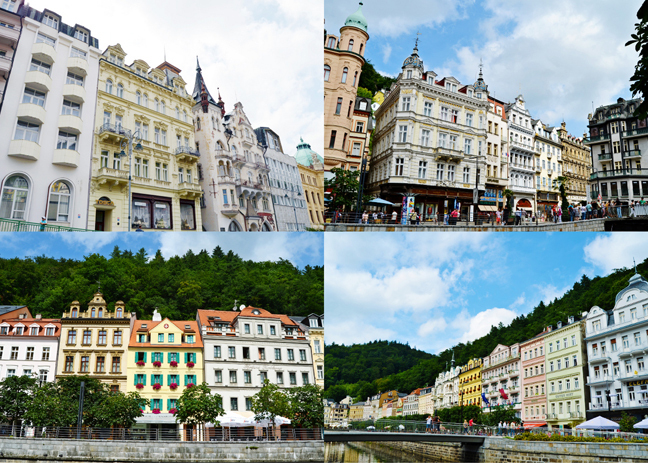 One of my favorite views in Karlovy Vary. 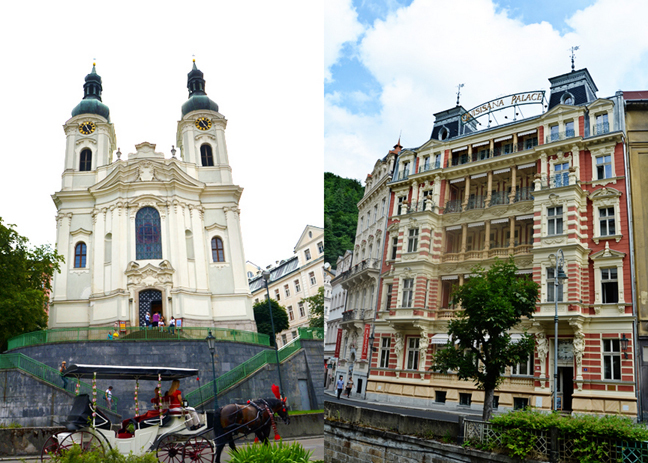 Around the corner we saw the majestic Church of St. Mary Magdalene perched atop a hill. We didn't go inside, too many stairs to carry the stroller :) Below the Church of St. Mary Magdalene is the Vrídlo, the hottest spring, inside a glass building called the Vrídelnií Kolonáda. The water blasts some 50 feet into the air. There are several more springs you can sample inside. Heading away from the Vrídelnií Kolonáda are Stará and Nová Louka streets which have several fine cafés and glass & crystal shops. The flowers in the windowsills get me every time. 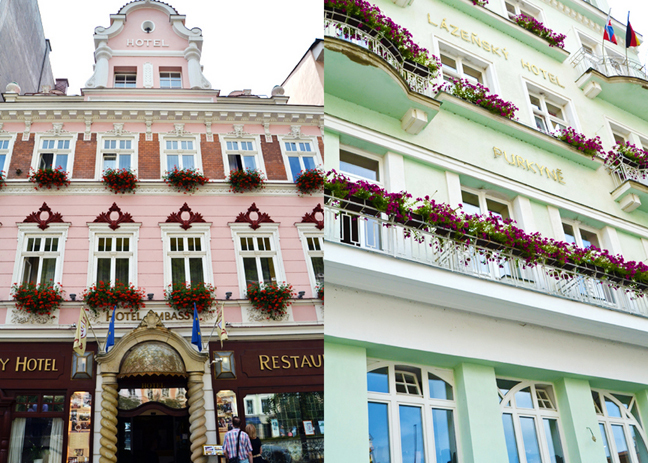 Both streets lead to the Grandhotel Pupp - the grande dame of hotels in central Europe. We crossed the river to see it up close and personal. Once catering to nobility from all over Europe, the Pupp still houses one of the town's finest restaurants - the Grand. Also, fun trivia, this is where they filmed the exterior scenes of the Hotel Splendide in Casino Royale which was Montenegro in the movie. 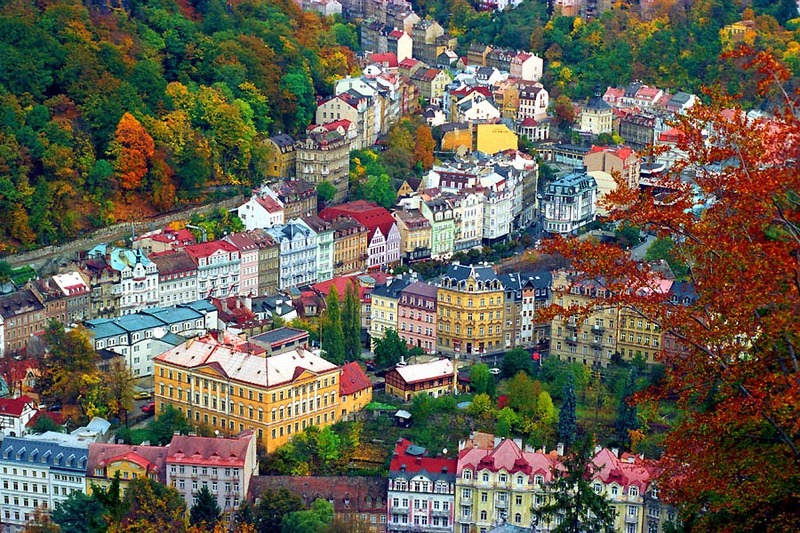 It's actually Karlovy Vary, Czech Republic. Screenshots of Casino Royale! I like how they covered the real name of the hotel with an awning. More pics of the real deal. The parking lot where James Bond goes into his car to fix himself after being poisoned. Continuing on through this beautiful city. Pictures at the riverbend. I was here! Karlovy Vary manhole cover. Is that what they're called? Down a narrow alley close to the Hotel Pupp is a funicular. 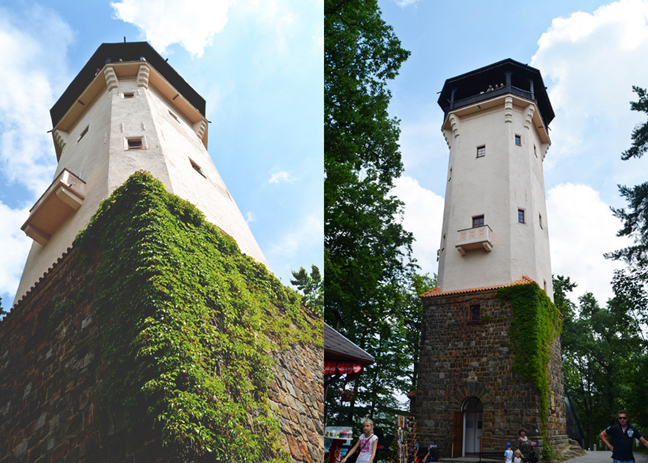 Up at the top is the Diana Lookout Tower. There's an elevator but I just climbed the 150 steps - every little bit helps with my journey to getting fit :) The views from the top were spectacular. There's also a restaurant, but we packed lunches cuz we only had $25 to spend the entire day including parking, a magnet, and cup souvenir. We were up at the top just long enough to take pictures all around and then headed back down. View through the funicular window. Jane and Fox. I have no words. The point of this collage is to show the woman with the cup - we noticed almost everyone in town seemed to be carrying a cup. These funny-looking cups are basically a mug with a built-in straw running through the handle. Young and old alike parade around with their mugs, filling and refilling them at each thermal water tap. You can buy these cups e'rywur for like $3 up to $12 or so. We picked out a cup and I was nervous to try the water after Chris' experience. But you know what? This nice and cold water was refreshing and tasted perfect! I wonder if it was even from a spring?? Fox claimed the mug as his own after this. But it's now sitting on our souvenir shelf in the kitchen, a fun token and reminder of our day in Karlovy Vary. Purple flowers and aqua shutters, oh my! We had 15 minutes to get back to the car before our time ran out. I felt so rushed and wanted to stay for so much longer! Good thing Karlovy Vary is super close by, I just have to go back. We had a wonderful day celebrating Chris' birthday tomorrow! Those cups are a trip!! LOVING all the photos ... the buildings are all gorgeous!!!! Wow, that place looks beautiful!! That was a fun birthday trip! Love the picture of Fox and Jane passed out. Happy Birthday, Chris! Loving all of those colors! So perfect!!!! You have to go back so I can see more of this gorgeous place! The architecture is really amazing! Love all of those great buildings!! The One with Studio Calico POET SOCIETY Layouts! The One with Studio Calico POET SOCIETY Sneaks! The One with Anyone Been to Kraków, Poland? The One with Chris's 29th Birthday!